As discussed at one of our ORLGA meetings and with Pro-Shop staff, the following information regarding the location of Red and Yellow hazards on Panther's Run hole #4 and Lion's Paw hole #10 is provided to answer questions regarding the location and types of water hazards on these two holes. 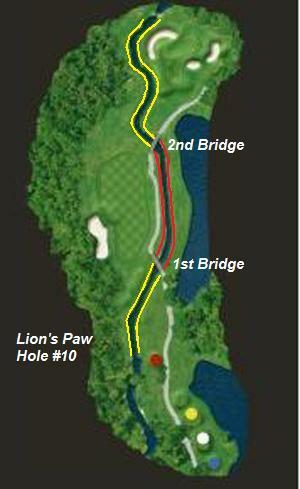 In the pictures of Panther's Run hole #4 and Lion's Paw hole #10, shown to the right, red and yellow lines are drawn to describe the location of the respective types of hazards (yellow for water hazard and red for lateral water hazard). When red or yellow lines on the ground are not visible, there may be red or yellow stakes to define the line of the hazard. If neither is visible, you should consider the boundary of the hazard 2 yards from the edge of the hazard. If possible, play the ball as it lies in the hazard with no penalty stroke. However, do not ground the club until you hit the ball. If you do, it is a two-stroke penalty. Play the ball as nearly as possible at the spot from where the original ball was last played with penalty of one stroke. Drop a ball behind the water hazard keeping the point at which the original ball last crossed the margin of the water hazard directly between the hole and the spot on which the ball is dropped, with no limit to how far behind the water hazard the ball may be dropped. Penalty is one stroke. Drop a ball outside the lateral water hazard within two club-lengths of and not nearer the hole than the point where the original ball last crossed the margin of the lateral water hazard. Penalty is one stroke. Drop a ball outside the lateral water hazard within two club-lengths of and not nearer the hole than a point on the opposite margin of the lateral water hazard equidistant from the hole. Penalty is one stroke. 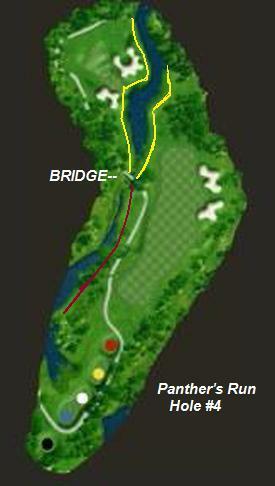 (This option may be practical for errant shots into the lateral water hazard of LP#10).